I don't usually like to sink into the depths of the political mire, but I can't help but notice an anomaly on Capitol Hill. Apparently Ted Cruz is wearing out his welcome. The junior Senator from the great state of Texas just wants to play by the rules --- the rules of the Constitution, that is. And that doesn't seem to sit easy with the entrenched members of Congress. He's even managed to piss off his fellow members of the Grand Old Party. I guess they're simply used to following a prescribed manuscript that is the correct line of behavior. Take last week's vote on raising the debt limit. The cronies in both parties tried to sneak an end-run around the American people. None of them wanted their names attached to an increase of the country's $17 trillion (and climbing) debt. They just wanted it done quietly and quickly. It would make their jobs so much easier! But Ted Cruz is a man with character and a conscience. He was determined that our elected officials would be accountable to the American people; no anonymous votes. If a Senator wanted to add more debt to the shoulders of his constituents, then he ought to be man enough to own up to it. That's why there was an allegedly acrimonious meeting last week at which Senate Majority Leader Mitch McConnell proposed waiving the 60-vote threshold normally required to advance legislation. Not so fast! 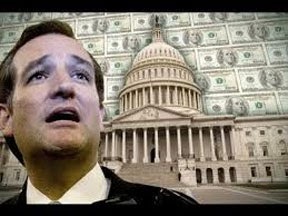 Cruz stood up and declared he would not let his fellow Republicans escape responsibility for their part in advancing the debt-limit bill. He said he would force at least five Republicans to vote with Democrats to overcome the procedural hurdle. And let their names be known! Now, it goes without saying, that this is not how Party politics usually goes down on the Hill. I think that power has corrupted 99% of the men and women who supposedly represent us, and they have lost their way. But Senator Cruz not only wants to make them accountable, he wants to publicly call them out by claiming they intentionally tried to mislead the public. And they are infuriated! It seems pretty clear to me -- Ted Cruz is a man who believes that the rules are the rules, the laws are the laws, and we need to follow them and not break them for political expediency. Yet there are still Republicans that apparently can't understand this moral man. They still see everything through a political lens, and question his ability to have a long Senate career. Has it ever occurred to them that he didn't come to DC to establish "a long career"? That, maybe, he came with true intentions; to follow through on the promises he made the folks back home and represent their wishes instead of the oligarchy's? Their ignorance is on full display in this remark: “At the end of the day Ted Cruz made McConnell have a 60-vote limit and the debt ceiling still passed. It’s not like he stopped the debt limit from being passed." That wasn't the point! It was about refusing politicians the opportunity to lie to the American people, and say they are legislating on our behalf. It was about honesty and integrity! In the end, 12 Republican senators—including McConnell and Texas's other Senator, John Cornyn—voted to advance the bill, which was then approved 55-43 and sent to President Obama. The bill will lift the $17 trillion debt ceiling until March 2015. All this political nonsense shows us why term limits are the only way to go. When a majority of those on Capitol Hill have become millionaires during their tenure, it can only mean one thing: they are looking out for their interests and not ours. "In my view, every Senate Republican should have stood together and said what every one of us tells our constituents back home, which is that we will not go along with raising the debt ceiling while doing nothing to fix the underlying out-of-control spending problem," Cruz said. That's what the American people have demanded ... stop the spending! And it is what Senator Ted Cruz is trying to accomplish, even as his colleagues keep adding more fuel to the fire. I know one man can't reform the greed and corruption that has overtaken our halls of Congress. But as long as Ted Cruz remains a righteous man, I will pray that God's protection and wisdom reigns down upon him. Isaiah 33:15-16 "He who walks righteously and speaks uprightly, who despises the gain of oppressions, who shakes his hands, lest they hold a bribe, who stops his ears from hearing of bloodshed and shuts his eyes from looking on evil, he will dwell on the heights; his place of defense will be the fortresses of rocks; his bread will be given him; his water will be sure." It is a sad state of affairs when our countries leadership has turned its back on the very ones it has sworn to represent. Not so surprising then when our "leadership" also turns its back on Israel. Our "system" has become so corrupt that even voting seldom works. Trying to do anything in erics court is useless as well. All we ever hear from our representatives is they are "going" to do something, but never do. I respect Ted Cruz for this backbone to change the system back to what it should rightfully be, however he has very little help. Our founding fathers told us when it gets this way it is our Duty to make the necessary changes. Time is quickly running out and I only see one group that is planning on going to our capitol and peacefully removing the rotten apples. Operation American Spring is this group, it will be interesting to see if it has any effect on it. Notably, the largest group of it is Texas! Many prayers are needed for this once great nation. God bless Ted Cruz. He is one of a vanishingly rare breed: a politician willing to stand up for what is right and true. I pray he stays the course, achieves success and leads others in Congress through his example of FOLLOWING HIS OATH.